An easy, fun way to add a pop of color or bring new life to any room in your home or office is with these beautiful Floral throw pillows. Dress up your bed, sofa or lounger with this decorative design art pillows. Perfect as bedroom décor, lounge décor Traditional living room décor. It adds a fun accent to any room. Throw pillows really do work wonders: they can transform any room from uninviting discomfort to warm and welcoming. And they really do go almost anywhere - arrange a couple on the couch or sofa, place one in your overstuffed chair for extra coziness, toss a couple on the bed and prop yourself up for a great read. 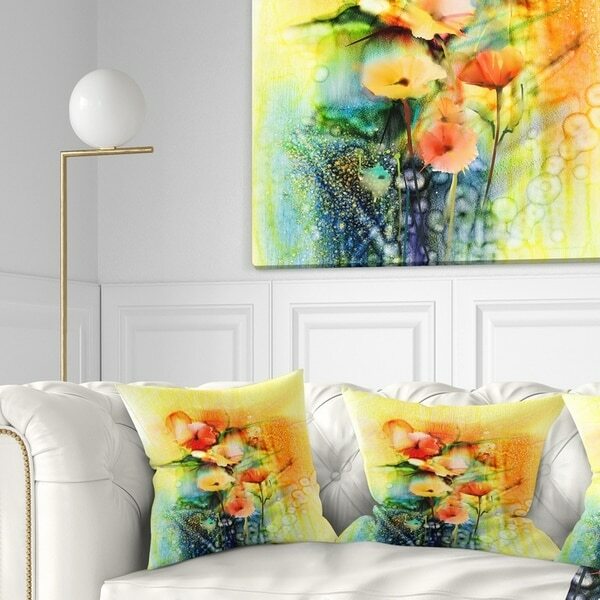 These Floral pillow is printed using High Color Density Italian inks to create a vibrantly colored, sharp artwork. Dimensions 16.0 In. X 16.0 In. X 5.0 In. Option: Medium - Rectangle - 12 in. x 20 in. Option: Small - Square - 16 in. x 16 in. Option: Large - Round - 20 inches round | Large - Square - 26 in. x 26 in. | Medium - Square - 18 in. x 18 in. ..Scandinavian touch through out the house. These are My colors. Needed this for Spring!